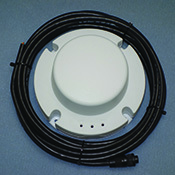 MarineGuard's cell transmitter will works worldwide. Your boat can be tracked anywhere in the world. You will receive a weekly status report from your boat alarm system. The report includes an update on the status of your alarm system and the transmitter's battery. If your alarm system is tripped, you will receive at test message to your cell phone or an email to your computer,iPad, or other electronic device. You will have access to an online account. Through this account, you can check on the status of your boat's alarm system, verify your boat's position. This feature is designed so you can track your boat if you own a fleet of vessel's, let friends and/or family borrow it, or if you spend days travelling on your boat and want to allow a loved one to check on your position. Track your boat if it is stolen. You will receive a notification every 15 minutes while the boat is moving. The notification will include latitude, longitude, speed and direction. Choose MarineGuard's Satellite Reporting and Tracking Option if you travel more than 8 miles offshore, do not have cell coverage, and/or live in an area not covered by MarineGuard's cell service. All Satellite Reporting/Tracking Packages include: Monitors security sytem and/or high water alert (bilge) system. Inlcludes weekly status report. Sends text and/or email notification if an intruder trips the alarm. Includes an online account where you can check alarm system's status and boat's position, the ability to verify your boat's position called pinging (There is an additional charge of $0.50/ping for this service. Only incurred if boat is pinged. Plus, notification sent every 15 minutes with movement updates if your boat is stolen or towed while alarm is armed. All Satellite Reporting/Tracking Packages also include: Automatic GPS tracking information (latitude, longitute, speed and direction) when the vessel is moving and the alarm is not turned on. You select the frequency of those notifications. MGM- S1: You forego any automatic GPS tracking reports when the boat is moving and the alarm is not turned on - meaning you are using your boat..
MGM-S6: You wish to receive an automatic GPS tracking report once every 6 hours when the vessel is moving (and not stolen). MGM-S12: You wish to receive an automatic GPS tracking report once every 12 hours when the boat is moving (and not stolen). MGM-S24: You wish to receive an automatic GPS tracking report once every 24 hours when the boat is moving. MGM-CS (optional add-on): Professional, licensed company monitors your alarm system around the clock. Notifiies up to 5 contacts that you provide if your boat alarm fires.